True medical breakthroughs are rare, but improvements and refinements of treatments, methods of diagnosis and surgical procedures are constantly evolving. The best doctors keep up with the changes so they can offer patients the most innovative techniques and the best chance for recovery. Here are just a few of the recent developments available in South Florida. Surgeons can cut open the body to get at the site of an aneurysm, a ballooning of the aorta, the largest blood vessel in the body; but frail older patients are not always good candidates. In those patients, a less invasive procedure may be used. Portable imaging equipment brought into the operating room allows doctors to see inside the patient and guide the tools needed to do the repair from inside the blood vessels themselves. But in complicated, lengthy procedures, the imaging equipment can overheat and shut down causing a delay in the procedure while it cools. A few doctors are performing these procedures in hybrid operating suites that provide state-of-the-art imaging for endovascular and surgical techniques, including the most complicated aortic aneurysm repairs. Dr. W. Anthony Lee, director of the endovascular program at Boca Raton Community Hospital’s Christine E. Lynn Heart and Vascular Institute, says the new hybrid OR there includes a fixed, cooled, imaging system that allows for very long, complex procedures involving not only the aorta itself, but the main vessels that branch off from it. “When the aneurysm starts encroaching on these branches, you have to use special [t-Branch] stent grafts, investigational in nature, and can only be used in a clinical trial,” says Lee, who is one of only three surgeons in the country conducting the trials with FDA approval. The stent grafts are threaded up through the groin area using a catheter and maneuvered into place by the surgeon. Lee says the procedures can take six hours or more. “Visualization is key, so the hybrid room allows people like me to see with utter clarity, and it allows me to do very complex, sophisticated procedures that we couldn’t do with a portable system,” he says. In the past, repair of the largest aneurysms extending through most of the torso, thoracoabdominal aneurysms, could only be done with an open surgery, Lee says, sometimes requiring a three-feet-long incision. Not all aneurysms are serious enough to require repair, but should be monitored on a regular basis. 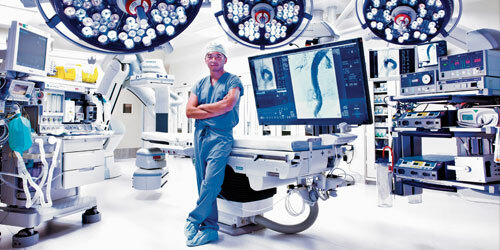 Dr. W. Anthony Lee, seen here with imaging equipment in the hybrid operating suite at Boca Raton Regional Hospital, is a graduate of Princeton University and earned his medical degree from Johns Hopkins University. His post-graduate training included a surgical residency at the University of Michigan, and vascular and endovascular fellowships at Stanford University. He has performed nearly 500 thoracic and 800 abdominal endovascular aortic repairs. To reduce the look of bags under the eyes, some surgeons remove skin and fat below the eyes to tighten up the area, but this can change the shape of your eye. Dr. Jacob Steiger, a Boca Raton facial plastic surgeon, performs the procedure from inside the lower lid using a method he compares to a hernia repair. “The first thing people see when they look at you is your eyes,” he says. “The eyes are the focal point of the face. Eyelid fullness is a symbol of youth and beauty, so you want them to look good. But as we age, the ligament between the lower eyelid and the bone of the eye starts to get loose and starts to sag,” he says, and as a result the fat herniates forwards. Steiger tightens up the ligament and puts the tissue back where it belongs, he says. He supplements the natural eyelid fat with fat taken from the patient’s abdomen or thighs to create a more youthful appearance. “It looks a lot more natural, and doesn’t change the shape of the lower eyelid, so you look like you,” he says. The procedure takes about an hour and is done under IV sedation, followed by about a week to recover because of bruising and swelling. Dr. Jacob Steiger is a graduate of the University of Miami School of Medicine and did his internship and residency at the University of Pennsylvania Health System, and a fellowship in facial plastic and reconstructive surgery at the University of Michigan. He is board-certified by the American Board of Facial Plastic and Reconstructive Surgery and the American Board of Otolaryngology. If you were having trouble sleeping at night, or your partner was because of your snoring, the doctor would have you come to the hospital, hook you up to a monitoring system, and hope that you were able to fall asleep and stay asleep long enough to assess the cause of your problem. If the doctor suspects that you have sleep apnea, a condition in which you may snore and stop breathing many times during the night, you may be able to have your sleep study at home in your own bed. “The most common reasons for doing a sleep study are snoring, daytime sleepiness and trouble staying asleep. That’s highly suspicious for sleep apnea, and it’s a common illness out in the community,” says Dr. Laurence Smolley, director of the Sleep Disorders Center at Cleveland Clinic Florida. Sleep apnea occurs when the base of the tongue obstructs the passage of air, and is more likely to occur in people who are overweight. Other suspected sleep problems, such as narcolepsy or periodic limb movement, still must be done at the sleep lab, Smolley says. “Our lab started out in the hospital, but that is not as quiet or comfortable, so we moved it out to the Marriott Courtyard where people can be in a room with a flat-screen TV but still be monitored by a technologist,” Smolley says. Six rooms are for patients, and a seventh is a control room with computers. Smolley says if sleep apnea is strongly suspected, the patient is a candidate for a home sleep study using portable monitors that measure the movement of air through your nose and mouth, your pulse rate, the oxygen level in your blood and the movement of your chest and abdomen. Patients pick up the monitoring equipment from the doctor and get a lesson in how to use it. They attach the devices as instructed before going to bed. The next day, they return the equipment, the results are reviewed and the patient comes back to hear the results. “The gold standard of treatment is the CPAP,” Smolley says. CPAP, or continuous positive airway pressure, is a mask that uses mild air pressure to keep the airways open while you sleep. Depending on how severe the problem, there are other options, such as an oral appliance worn during the night. Dr. Laurence Smolley is certified by the American Board of Internal Medicine, with subspecialty certification in pulmonary diseases and critical care medicine, and certified by the American Board of Sleep Medicine. He has a Bachelor’s of Science degree from Yale University and received his medical degree from New York University. He did a pulmonary fellowship at Jackson Memorial Hospital/University of Miami. After a lumpectomy to remove a tumor, patients have radiation treatments five days a week for up to six weeks. As soon as the tumor is removed, an orb-shaped device is inserted in the cavity to irradiate the area for 20 to 40 minutes before the incision is closed. For some patients, this will be all the radiation they require. Others may need a short course of radiation after recovery. Dr. Joseph Casey, chairman of the Breast Program Leadership Committee at Holy Cross Hospital in Fort Lauderdale, says the new approach uses a device called Intrabeam to perform intra-operative radiation therapy before the patient leaves the operating room. The typical course of radiation can take up to two months and involves going to a facility five days a week. “For people with limited mobility or who live far away that was quite a hardship, so we’re looking at ways to reduce that,” Casey says. Intrabeam radiation is delivered through a miniaturized spherical device that comes in different sizes to fit the excision site, delivering a prescribed dose of therapeutic radiation concentrated at a depth of one to two centimeters. This targets any remaining cancer cells but spares healthy tissue. Clinical trials of the treatment were conducted in Europe and the results were published in the Lancet medical journal in July 2010. “Right now we’re only using it on older women, over 60, but we’ve seen women express a real preference for this if it’s available to them because of the convenience factor,” he says. Dr. Joseph Casey is board certified by the American Board of Surgery and the American Society of Breast Surgeons in both ultrasound and stereotactic breast biopsy. He received a Bachelor of Science from the University of Notre Dame, and his medical degree from Northwestern University. In traditional liposuction, the surgeon inserts a cannula – a suctioning probe – through a small incision and pushes and pulls the device through the fat layer to break it up. The suction pump draws the fatty tissue out of the body. The process can damage tissue such as nerves, blood vessels and collagen. Ultrasound-assisted liposuction uses specially designed probes that deliver ultrasound waves into the fat layer to selectively target and liquefy fat. Other body tissues like blood vessels and nerves are left intact. Dr. Tim Abou-Sayed, a plastic surgeon at Trasformare Fifth Avenue, says the new technique is less invasive and affords the patient less down time. He uses a system called VASER Lipo. Sayed says Sound Surgical, which makes the system, also teaches doctors how to sculpt the body to achieve a particular look. In the past, the so-called lunch-time facelift involved several trips to the doctor’s office over a period of months for treatments exposing the skin and underlying tissue to radiofrequency waves to heat the tissue, eventually shrinking it, providing a younger look. Dermatologist Will Richardson, of Natura Dermatology, uses ultrasound to heat the same layer of tissue addressed in a surgical facelift, and does it in a one-time process that takes about an hour in his office. As he is performing the procedure, he is able to view the tissue on a monitor. “The safety of it is we’re actually seeing the tissue layer we’re delivering the treatment to during the whole procedure,” he says. Richardson says research showed that Ultratherapy, as it’s called, specifically targets the deep, structural skin tissues where collagen is found, including those layers usually addressed in a surgical facelift. The heat generated tightens the skin non-invasively and the healing process over time increases the amount of collagen present. “It’s beauty from the inside out,” he says. Ulthera, Inc., which makes the equipment he uses for the procedure, received FDA approval for such procedures in 2009. Dr. Will Richardson received a Bachelor of Science degree from Pembroke State University in North Carolina, and his medical degree from East Carolina University. He did his residency in dermatology at the University of New Mexico, and is board certified by the American Board of Dermatology.